Go Figer, Tommy’s Riding High! 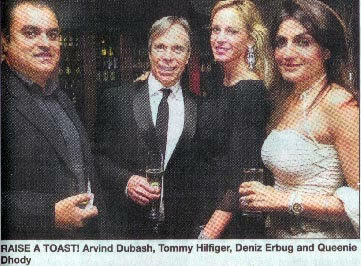 Tommy Hilfiger, the first American designer to have launched in India, celebrated his third anniversary in true style. It was an evening to remember for sure – father and son duo, Mohan and Vijay Murjani, hosted a dinner to mark this wonderful event. And guess who the guest of honour was? Tommy Hilfiger himself. “My association with India dates back to the 1970s. I simply love this country and culture. In fact, I have always considered India as my second home and I’m very happy that people have embraced my brand,” said the legendary designer. 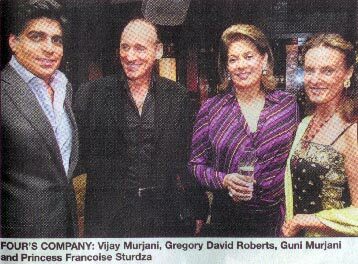 Mumbai, including Parmeshwar Godrej, Arvind Dubash, Homi Adajania., Celina and Jeh Wadia, Devieka and Suresh Bhojwani, Ajitabh and Ramola Bachchan, Queenie Dhody, Haseena Jethmalani, Simone Singh and Fahad Samar, US Consulate General Michael Owen and wife Annerieke, author of the famous novel Shantaram Gregory David Roberts and Princess Francoise Sturdza. And with Guni and Arti Murjani playing hostesses, you knew it was going to be an evening full of elegance. The evening was not only about Tommy turning three but also announced the onset of the Spring/Summer 2007 collection by the designer.